Ymuno is for disabled children aged 3 – 14 (18 if disabled). Ymuno provides support to access a local childcare club or playscheme provision. The schemes are registered with CSSIW and can be searched for via the Ceredigion Family Information Service. The leader of the scheme or club applies direct to DASH – we will give them a password and then they can apply and invoice online. The scheme pays towards the cost of an additional support worker if that is needed to make the scheme accessible for a disabled child. Most children accessing this scheme will have full 1-to-1 support. If less support is needed, support workers can be shared between two children – if the club leader feels that is appropriate. DASH wants to make sure that disabled children in Ceredigion have the same choice about what to do in their leisure time as other children do. 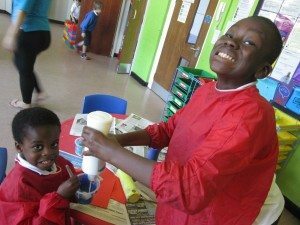 During the Easter and summer holidays our own playschemes are very good value for money, and offer a wide variety of activities. Although this suits many children and families well, we know that a local club is a better arrangement for some, and local clubs often run outside of these times as well. Outside those school holidays there’s still lots of opportunities to get involved in all sorts of activities, but sometimes there can be barriers to getting involved. With the help of a support worker, we may be able to remove that barrier, and that’s what Ymuno+ is all about.